Anterior Talofibular Ligament (ATFL) which resists the foot going into inversion while the foot is in plantar flexion. Most commonly injured in lateral ankle sprains. Calcaneofibular Ligament (CFL) resists the foot going into inversion while the foot is in dorsiflexion. This is the second ligament most commonly injured in lateral ankle sprains. Normal range of motion for eversion of the foot is 25o. These stretches are in order of less aggressive to more aggressive. Stretches are typically performed by holding each stretch for 20-30 seconds and repeated three times. They can be performed through out the day and especially after activity that has stressed the affected muscles. 1. Using a band or towel wrapped around the arch of the foot. 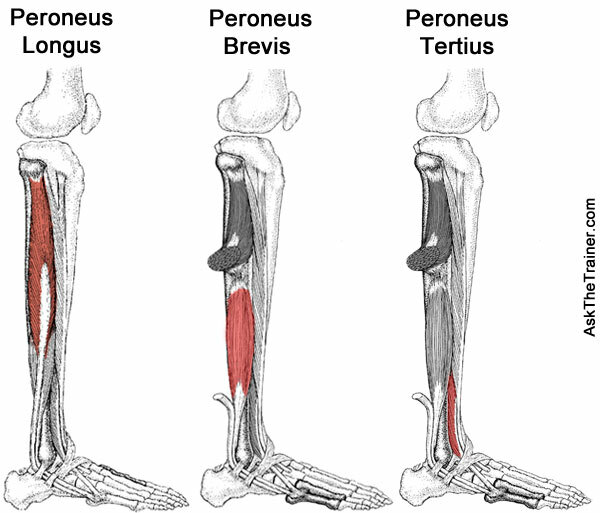 Pull the foot into eversion and dorsiflexion. 2. Using a step or slanted surface place foot on surface with toes turned in and lean into the stretch by bending leg. 3. In standing turn the foot inward (inversion) and allow weight through the outside part of the foot. Weak fibularis muscles can make one more susceptible to lateral ankle sprains. Also, after one has suffered from a lateral ankle sprain they may perform the following exercise along with other ankle motions to rehabilitate the ankle and prevent future sprains. These exercises are in order from least aggressive to more aggressive. Must start with the least aggressive and progress accordingly with ability and stage of healing of injury. b. Perform three sets of 10-15 repetitions, two to three times a day. a. Sit with injured leg straight and have resistance band held or tied medial to injured foot. Loop band around the balls of the foot with toes point straight in the air. Begin turning toes outward away from where is the resistance is being given then return to start position. Make sure to only move the foot and not allow the leg to guide the movement. a. Stand on board on injured ankle hold on to a stable surface lightly for support. Move the board side to side so the edges of the board touch the ground. d. Preform three sets until failure. Aim for completing two minutes.